No common name. All Euscorpius were previously placed in the family Chactidae. This species was formerly known as a subspecies of E. germanus, E. germanus alpha. DNA and alloenzym analysis of the different populations of E. germanus in the alpine region of northern Italy, southern Switzerland and southern Austria revealed the existense of to different clades that were separated by the river Adige (Etsch) in northern Italy. These two clades corresponds morphologically to the two subspecies E. germanus germanus and E. germanus alpha. The genetical difference between the two clades were large enough to justify an elevation of the subspecies E. germanus alpha to species status: E. alpha. Alpine regions in northern Italy, west of the river Adige (Etsch). This species is found in mountainous areas. Few medical data available, but data from Italy suggest local effects only. Mildly venomous. Harmless scorpion, which rarely will use its stinger. Torregiani, F. & C. La Cavera (1990). Puntura di scorpione (Euscorpius, sp.) in Italia e rassegna dello scorpionismo [Scorpion sting (Euscorpius, sp.) in Italy and scorpionism review.] Minerva Medica, vol. 81 (suppl. 2), pp. 137-145. Crucitti, P. (1993). Distribution and diversity of Italian scorpions. REDIA, vol. LXXVI (2), pp. 281-300. Nuclear and mitochondrial markers reveal the existence of two parapatric scorpion species in the Alps: Euscorpius germanus (C. L. Koch, 1837) and E. alpha Caporiacco, 1950, stat. nov. (Euscorpiidae). Revue Suisse de Zoologie, 107 (4), pp. 843-869. This species is a small black scorpion that grows up to 3 cm in length. 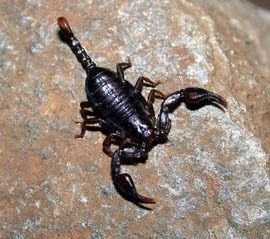 It is a typical fossorial scorpion with large, strong pedipalps, a stout body, short legs and a short, thin tail (metasoma). E. alpha has sometimes 6 trichobothria on the ventral aspect of the pedipalp patella, while E. germanus has always 5. The problems is that some individuals of E. alpha may have only 5 too. This means that one need to have several individuals of a population to be able to separate the two species by use of trichobothrial numbers. But any scorpion from the E. germanus-group collected in the alpine regions in northern Italy west of the river Adige (Etsch) is E. alpha. See the Euscorpius identification key for more details. This species is probably rare in captivity.